Greetings from Crazyville: Of All Things...GLEE! After hearing about it NON-STOP from some teenagers, I thought I'd watch just ONE episode to see what all of the fuss was about...ha! Let me preface this with the fact that we don't have cable or satellite. Heck, our antenna isn't even working so no local channels in this house. We're livin' off the land, y'all. To answer your question...YES, I'm completely oblivious as to what is happening in the world. This is not a good thing especially when most of my daily conversations are with a two-year old. Isn't Bob The Builder running for presidency? However, we do have a little thing known as Roku. Since we're trying to keep our budget minimal...who am I fooling? We're just cheap!...we opted into Netflix for a whopping $7.99/month! Netflix streams through the Roku box, and we have virtually any movie or TV show at our fingertips. Who needs cable? Oh, no commercial interruptions, either. Although, I'm really missing out on some hilarious Clorox commercials! So sad. On the rare occasion that I do decide to sit down briefly to watch a little TV, it's hard for me to walk away when I find a new can't-miss-a-single-episode-or-my-life-will-be-ruined series. It's like owning the box set for every TV show known to man. And this is NOT good, people! Glee does take place in a high school, and I'm not too emotionally drawn into the high school drama. But it's like a never-ending musical! It's pure happiness! One day, I WILL make it to Broadway...no, not me ON Broadway, silly goose! I'll be sitting in the audience in total awe. So, yes, Glee has totally captivated my attention. For the most part, everyone sings and dances fairly well...all expect for Finn. He's got the whole I'm-too-big-and-awkward-to-dance thing going on. I even get embarrassed for him every time he dances. Oh, well! There ya have it. 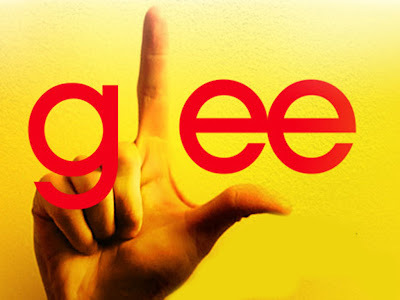 Of all things, I'm now addicted to GLEE! This is a sad confession, I know.